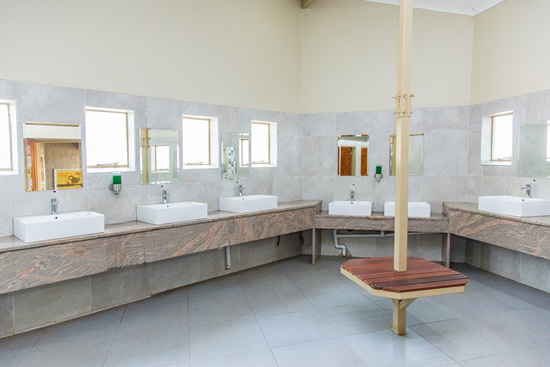 The facilities include 39 charming Log Cabins, 18 Chalets, 8 Family Houses and 1 Guest House. The Caravan / Camping Park stretches to the water's edge and offers 252 Stands (146 Powered and 106 Non-powered) which are serviced by 7 neat Ablution Facilities. Bookings are essetential for day visitors. NO GLASSWARE in and around the swimming pool. NO ALCOHOL in and around the swimming pool. Sunday to Thursday nights out of season. (Maximum two people) Open plan room (bedroom, Kitchen) with two single beds. Fully equipped Kitchen with basic crockery, cutlery & cooking utensils for two people, stove with oven, microwave and a fridge. 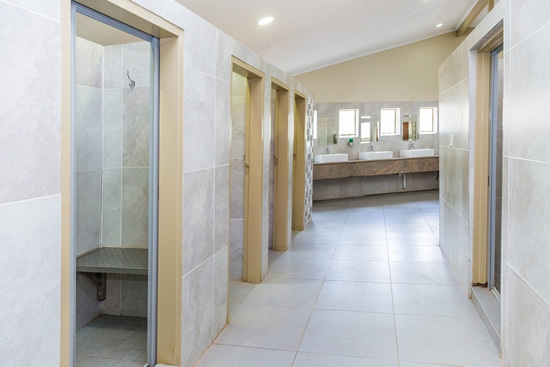 En-suite bathroom with shower only (no bath), basin and toilet. Bath towels for two people. Bed linen: (sheets, blankets, pillows) for two people. Air-conditioner, television (12 selected DSTV Channels) and "braai" area. (Maximum two people) One bedroom with one double bed. Open-plan Kitchen / Lounge. 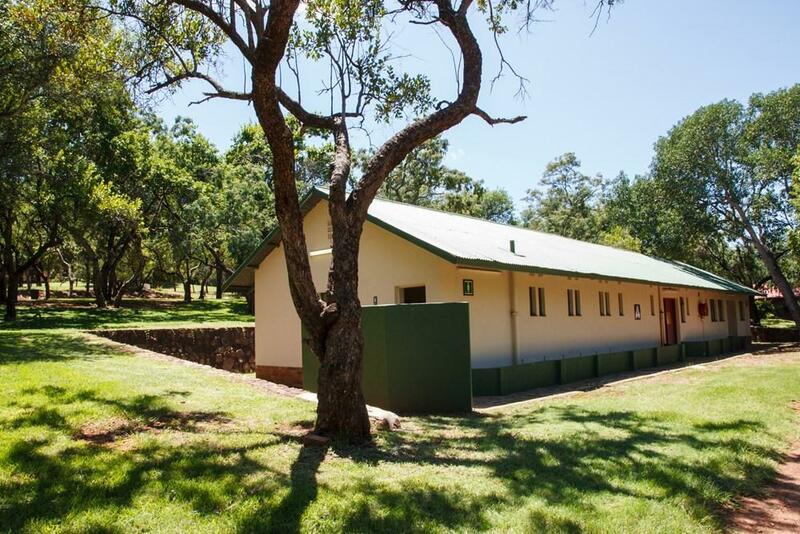 Fully equipped Kitchen with basic crockery, cutlery & cooking utensils for two people, stove, microwave and a fridge. Bathroom with a bath, shower and basin, separate toilet. Bath towels for two people. Bed linen: (sheets, blankets, pillows) for two people. Air-conditioner, television (12 selected DSTV Channels) and "braai" area. (Maximum four people) Two bedrooms. One Bedroom with one double bed. Second Bedroom with two single beds. Open-plan Kitchen / Lounge. Fully equipped Kitchen with basic crockery, cutlery & cooking utensils for four people, stove, microwave and a fridge. Bathroom with a bath, shower and basin, separate toilet. Bath towels for four people. Bed linen: (sheets, blankets, pillows) for four people. Air-conditioner, television (12 selected DSTV Channels) and "braai" area. (Maximum four people) Two bedrooms: Main room has one double bed with en-suite bathroom with shower, bath, basin and toilet. Second room has one single bed and one bunk bed set with en-suite bathroom with shower, basin and toilet. Kitchen fully equipped with basic crockery, cutlery & cooking utensils for four people, stove with oven, microwave and a fridge. Bed linen: (sheets, blankets, pillows) for four people. Lounge with a television (12 selected DSTV Channels), Air-conditioner and "braai" area on the patio. Top bunk bed for small child. (Maximum six people) Three bedrooms: Main room with a double bed and two single beds in the second & third bedroom each. Lounge and open plan dining room. Fully equipped Kitchen with basic crockery, cutlery & cooking utensils for six people, stove with oven, microwave and a fridge. Bathroom with a bath and basin, separate shower and separate toilet. Bath towels for six people. Bed linen: (sheets, blankets, pillows) for six people. Air-conditioner, television (12 selected DSTV Channels) and "braai" area. (Maximum six people) Three bedrooms: Main room with a double bed and en-suite bathroom with a bath, shower, basin and toilet. Second & third room each has two single beds. Bathroom with a bath, basin and separate toilet. Bath towels for six people. Lounge and open plan dining room. Fully equipped Kitchen with basic crockery, cutlery & cooking utensils for six people, stove with oven, microwave and a fridge. Bed linen: (sheets, blankets, pillows) for six people. Air-conditioner, television (12 selected DSTV Channels) and "braai" area. (Maximum eight people) Three bedrooms: Main bedroom with a double bed and en-suite bathroom with bath, shower, basin and toilet. Second bedroom with a double bed and en-suite bathroom with bath, shower, basin and toilet. Third bedroom with four single beds and en-suite bathroom with shower, basin and toilet. Kitchen fully equipped with basic crockery and cutlery (for 8 people), cooking utensils, stove, fridge and microwave. Lounge with a TV (12 selected DSTV channels), Air-Conditioner and Braai area. Check in time: 15h00 Check out time : 11h00. Weekends Min 2 nights (Friday and Saturday). 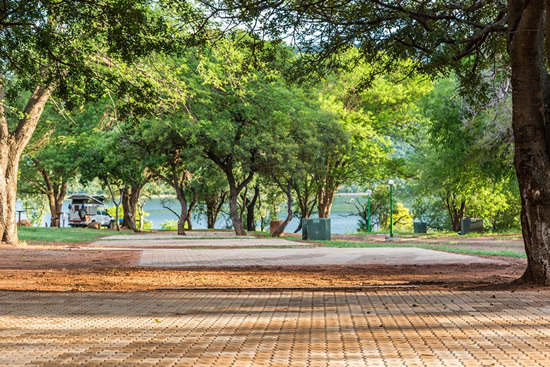 Pensioners and Disabled South African Citizen discount is applicable outside peak-season, subject to availability and depending on season. These discounts are Property-specific (discounted on high-season rate only). Please contact the Property directly. Proof may be required. 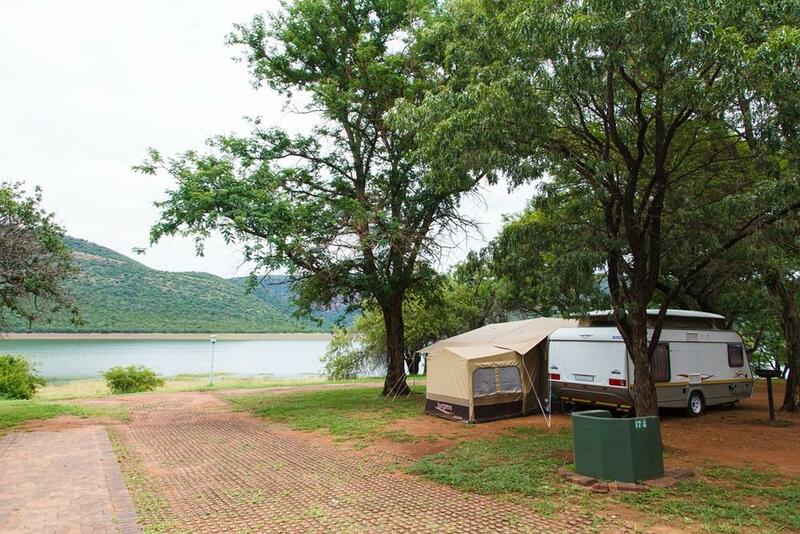 Additional vehicle: R50.00 per night. 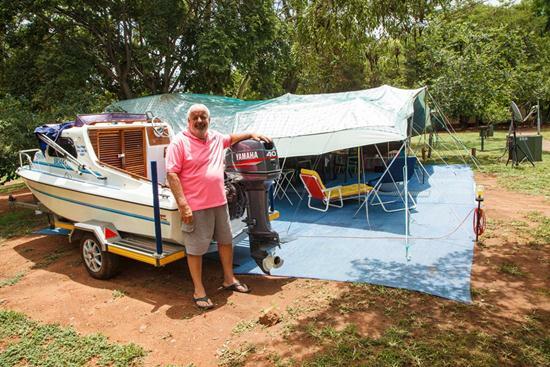 Boats: R50.00 per night. Well-shaded caravan stands with green lawns stretch to the water edge and is serviced by 7 neat ablution blocks and a Laundromat. 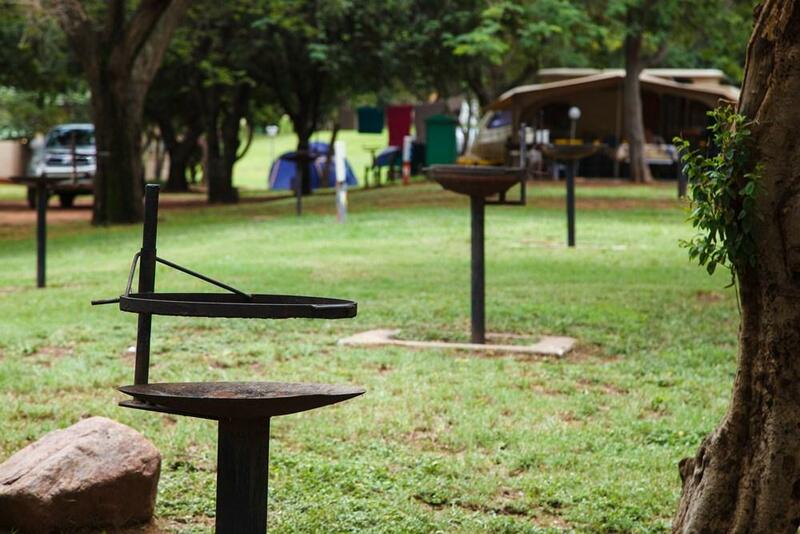 All non-powered camping sites are currently being upgraded to powered camping sites. Well-shaded caravan stands with green lawns stretch to the water edge and is serviced by 7 neat ablution blocks and a Laundromat. R3 375.00 per 30 days (includes 2 people sharing). Boats: R650.00 per 30 days per boat. A maximum of 3 consecutive months allowed. If your long-stay falls within a peak season weekend, the peak season rates will apply. Long-stay rates do not apply for December. No pre-allocation of camp sites. Strictly first come first serve. 226 x Power sites, 26 x Non Power Sites (currently in the process of being converted to powered sites), 1 x Laundromat. All PS sites have power points and require a male caravan plug for use, which is available from the shop. Rates for the caravan park are calculated per site and per person per day. Max 8 persons per site. Rates are per night. Minimum nights rates apply. Senior Citizens: ( Guests from 60 years of age and older). Discounted rates during low season. For Caravan Stands, discount only applies to rate charged for stand (discounted on high-season stand rate only). Children 4 years and older: pay the per person rate. 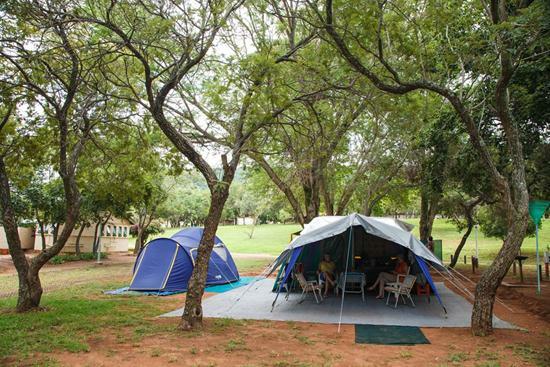 Only suitable, recognized tents, caravans and motor homes are allowed to camp in the caravan park. Only one vehicle per site included in rate. Extra vehicles: R50.00 per night. Boats: R50.00 per night.